The perfect boots can take you hundreds of miles, keep your feet comfy and allow temperature control regardless of the environment. It sounds a bit too much, but you can actually achieve all these with the right hunting boots. The market is quite diversified, so choosing the right pair might feel challenging, yet it's not impossible. Hunting experts recommend researching the best rated items first. 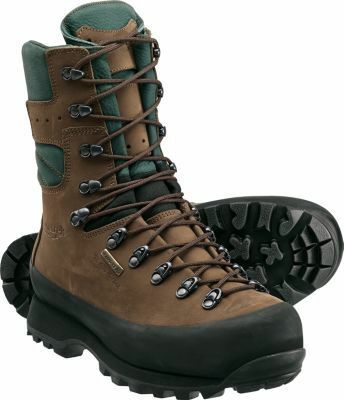 Kenetrek Men's Mountain Extreme 400 Hunting Boot is one of them and can certainly stand up in the crowd with its features. 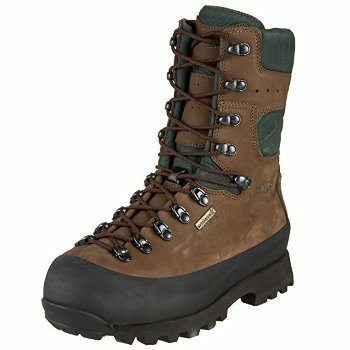 There are countless Kenetrek boots reviews out there, so there must be something good about them. Whether you're looking for new or used Kenetrek boots, chances are you'll end up with some hunting boots that will make your life easier. 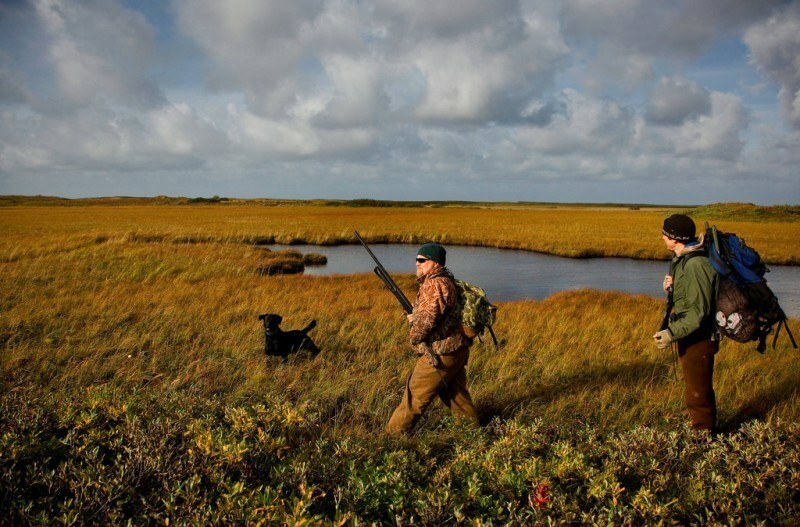 The right or wrong footwear can easily affect your hunting session. After all, stomping through muddy bushes with cold feet and blisters is something you want to avoid. Luckily, this model comes with just the right features to ensure a comfortable and efficient experience. Make sure you research all these features prior to buying, but also check the Kenetrek boot sizing guide for more information. Now, what should you know about these boots? Available in a slightly lighter non-insulated model too. Available in all possible sizes. One piece construction - No seams. The sizing guide is imperative when buying footwear over the Internet. Sure, you can still return your boots and get a different size if they don't match, but luckily, the sizing chart will make it crystal clear. However, you might want to go up about half a size from your regular street footwear. Why? Easy! You might need thicker socks or some extra leg room during your long hunting sessions. The boots weigh 4.2 pounds. It's a standard weight for quality boots in this segment. Sure, they're heavier than your sneakers or street shoes, but they're overall lightweight for a hunting experience. You can also find these boots in a non-insulated version that weighs 3.9 pounds – not such a big different and not worth the minus. The manufacturer doesn't mention too many things about the maintenance, so treat your boots just like any other boots. You should use some wax a few times during the season and perhaps one time before storage at the end of the season. It obviously depends on how often you use them. Let them air dry after you wash them and never put them in the washing machine. Researching the actual construction of Kenetrek boots is essential. According to a series of reviews, each part comes with a different build in terms of comfort and durability. The uppers are made from premium full grain leather. They measure 2.8mm in thickness – a front runner. The boots come with a one piece construction. There are no seams or glued parts. As a result, the boots will last for years, but they will also face abrasion and improve insulation. The collars are also made from leather – softer for more comfort. However, they are also extra padded, so they won't put any pressure points on your feet – quite important for long hunting sessions. The midsoles are likely to take a good beating without showing any signs of weakness. They're built with heavy duty uses in mind. They feature full length one piece construction and they're made from nylon. They're 7mm in thickness. In other words, they'll clear the pressure off your feet in uneven and harsh terrains, but they'll also give you some flexibility. Finally, don't overlook the sole guards. They may not be the most important parts in the construction of a hunting boot, but they do have a solid role. They're made from rubber, so they'll last forever. They are reinforced for extra protection against rocks and abrasion. According to multiple Kenetrek hiking boots reviews, this model is fully insulated. Of course, you can also purchase it in a non-insulated design, but it's just not worth it. Even if the weather is nice, woods are shady and won't let water evaporate so easily, so you'll still face wet environments. The insulated model features the Thinsulate Insulation technology. It keeps your feet warm during the wintertime and cool during the summertime. Besides, the insulation won't make them look bulky or feel uncomfortable. In terms of waterproof capabilities, you usually have to sacrifice the breathability. Waterproof shoes don't usually let your feet breathe and vice versa. Not anymore! The Kenetrek boots come with WindTex membranes. They're waterproof, as well as breathable. Your feet won't sweat and the boots won't develop any nasty odors during long hunting sessions. The lightweight profile is not the only aspect that will add to your comfort. Sure, it does pay off wandering around the woods without feeling any pressure on your muscles, but the exclusive outer sole design adds to this experience as well. The outer sole is based on the K-Talon High Traction technology. What does it mean? It has an open tread pattern, which is directly responsible for a multi-directional experience in harsh terrains, such as mud or snow. 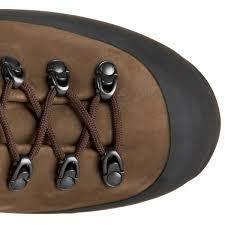 The sole comes with traction teeth around the heel and toes for an extra grip. 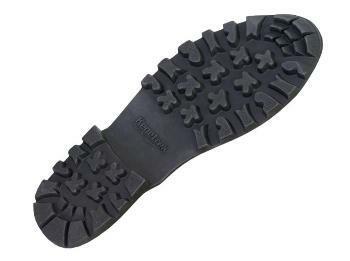 Whether you go up the hill or you have to go down an abrupt area, you can count on an excellent traction. As for the sides, you have small lugs to help when side hilling. All in all, the exquisite traction clears some of the pressure and tension off your upper body while trying to maintain balance. Small features often make the difference and according to most reviews, this model makes no exception either. The lace locking system may not seem too relevant when you buy hunting boots, but it can add to your experience. For instance, you can lock laces in two different sections. The bottom five laces go around the toe, while the upper 4 laces go around the ankle for more tightness. Stitching is one of the first things you should look at. No matter how durable the materials are, poor stitching will cause the boots to fall apart in no time. Fortunately, Kenetrek has brought in double and triple stitching on the entire boot at every single seam. 1. What size should I order? Kenetrek sizes are similar to regular shoe sizes. Given the fact that you might need heavier and thicker socks, most experts recommend getting half a size bigger. Besides, you will need some extra comfort and flexibility for your toes, hence the necessity of extra space for them. 2. What lasts longer, a boot with or without waterproof lining? The waterproof lining doesn't have too much to do with the actual durability of the boot. Opt for quality materials instead. If you get leather hunting boots, they can last forever with the right maintenance – with or without waterproof lining. 3. Are hunting boots available in more widths? Just like most types of footwear out there, these hunting boots are not available in more widths. The width is directly responsible with the length. In other words, the longer the shoe is, the wider it will be as well. Whether your feet are too wide or too narrow, don't sacrifice the length. Interested to know some other hunting boots brands? Be sure to check out our verdict. As a short final conclusion, a little research can push you in the right direction. You'll find plenty of Kenetrek boots reviews out there and different people will claim on different positive aspects. These boots are rated 4.4 out of 5 stars. Up to 84% of all buyers find them perfect or almost perfect and it's easy to tell why – good traction, plenty of comfort and quality materials. What else can you ask for?